I’ve watched the Rocks since the age of eight (almost 31 years ago) and my first memories include the FA Cup win over Exeter and a mascot appearance in a heavy (6-1 – I think!) 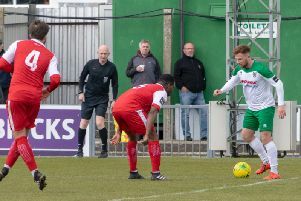 home defeat to Redbridge Forest. And even when I had ten years away working in Scotland and Bristol, I always looked out for the results and watched when visiting family. In Sir Alex Ferguson’s book on ‘Leadership’ he describes a football club like any business – in that it needs to be well run with a system (or ‘ethos’ as I prefer) that is deeply ingrained. In many years of following the Rocks, it is clear that they also hold those strengths of being well run and having an ethos ingrained throughout the club. On limited (but well managed) budgets the Rocks produce a style of football that purists enjoy: a passing game – encouraged by the most stunning of playing surfaces. This style of football has allowed the club to attract many technically gifted players. The pitch and style of play is well admired by the surrounding pro clubs and the Rocks can be proud to have played a part in the careers of Lewis Dunk, Joel Lynch and Tommy Elphick, among others. In recent times contracted players such as Craig Robson and Grant Smith have gone on to move up the football ladder. The Rocks faithful have also seen other top players who, in another life, might have played at a higher level. Michael Birmingham is one player who could feel unlucky not to have done so. With a pitch, style of play and ability to attract technical players, the club have also been able to boast many top-class coaches and managers. Names include Dave Thomas, Paul Holden, Darin Killpartrick, Jamie Howell and now Robbie Blake. The club have held their own well in the respective leagues (mostly in or around our current level). High and low points include seasons in Conference South and Ryman one south. The ground itself has also been slowly improved over the years with comments from away supporters reflecting their admiration for the facilities. The success has been delivered under the astute management and leadership of Jack Pearce, helped of course by many excellent committee members, support staff and numerous volunteers. Since returning to the area six years ago I have witnessed more highs and lows. A superb FA Trophy run and league promotion have been the high points and the disappointment of relegation last year being the low. Relegation can hit clubs hard (the Rocks have felt this before) but that ethos has allowed the Rocks to start this season well. Player retention from last season has been good. In addition, the club have attracted two excellent forwards (Dan Smith and Brad Lethbridge), an impressive left back (Joe Tomlinson) and a positive winger (Mason Walsh). That’s not to mention the new head coach Blake. Injuries have not been kind. To lose players of the stature of Keaton Wood and Smith at the same time would hit any team hard. In a town of only around 65,000 people the club can be proud of where they sit in the football world. At present we have a general manager who is on the FA board, a first-team head coach who has played Premier League football, a highly respected secretary, a well-run supporters club and a young talented squad (average age early 20s) who play the game the right way. A top-five finish this season is certainly achievable. If it doesn’t happen, Rocks fans can be assured that the ingrained ethos will ensure that success will come again soon.